Every year our Membership team carries out an audit of our members’ Continuing Professional Development (CPD) records to ensure that members have fulfilled the requirements of the CPD Scheme. Each year 10% of IFoA members in CPD categories 2, 3, 4 and 5 are asked by the Membership team to provide evidence of their verifiable CPD activities for that CPD reporting year. All our members are obliged under the Actuaries’ Code to maintain their competence and the IFoA CPD scheme provides a framework to help members meet this obligation. Our Membership team have now completed their CPD audit for the 2016/2017 CPD year and are pleased to share the results with IFoA members. The IFoA Membership Committee are happy to report that 93% of the auditing of CPD records for 2016/2017 carried out by the Membership team was straightforward. This means that members selected for audit were able to provide evidence to support the activities recorded in their online record without any trouble. Other members selected for audit were given assistance by our Membership team, however all audits were successfully concluded. Some members have been asked to verify their records again next year to assure the Membership team that they have a full understanding of their CPD requirements. 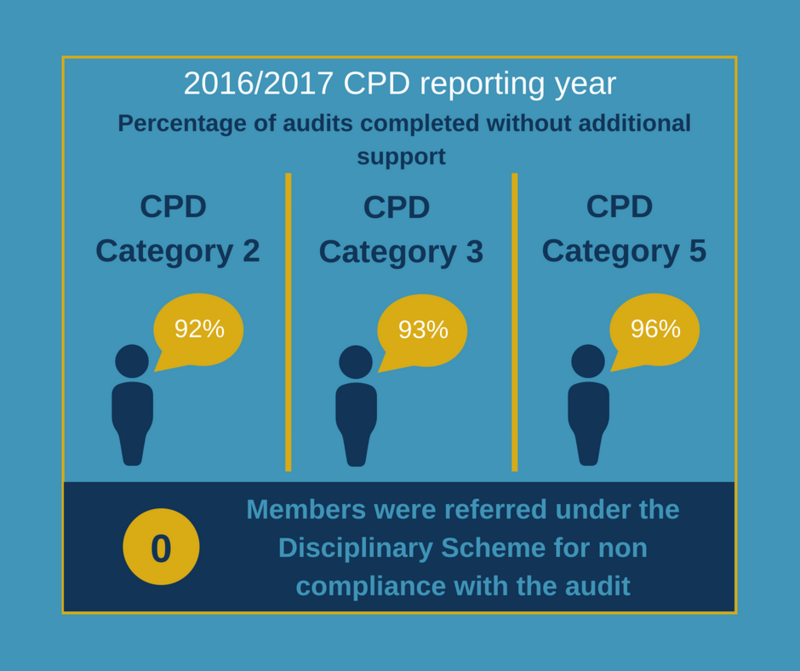 This year we are delighted to report that no members were referred under the IFoA Disciplinary Scheme for non-compliance with CPD auditing, an improvement on the 3 referrals made last year. If you are selected for CPD audit, our membership team will contact you by email and will be asked to provide evidence to meet your minimum requirements. Due to the CPD cycle, you are advised to keep evidence of each CPD activity for a minimum of two years from the date of the activity. Find out more about the IFoA CPD scheme, CPD audit and how you can meet your requirements. If you have any questions about CPD audit or have difficulties completing or recording your CPD please contact our Membership team at membership@actuaries.org.uk.